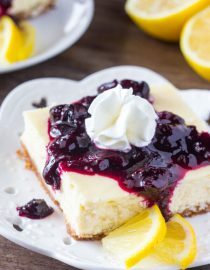 Lemon blueberry cheesecake squares are smooth & creamy with a delicious lemon flavor and crunchy graham cracker crust. The blueberry sauce makes them extra special! Oh hi there! It’s Fiona stopping in from Just So Tasty. And today we’re making these Lemon Blueberry Cheesecake Squares. 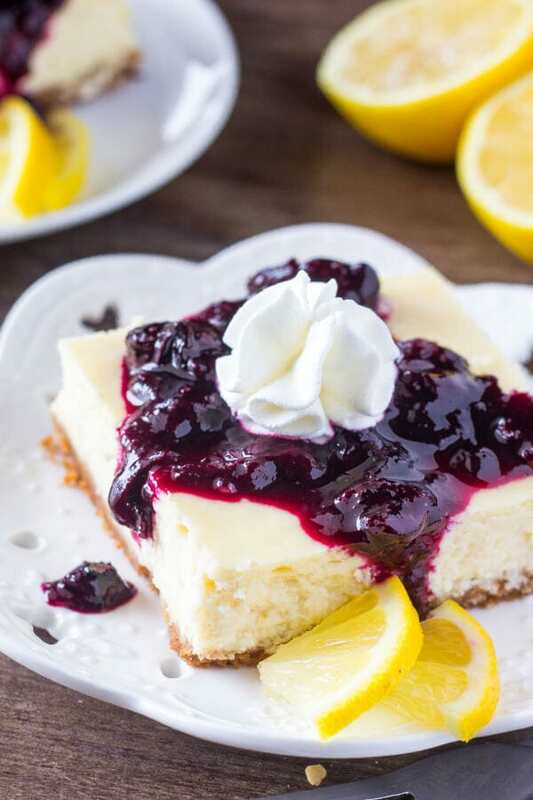 I love lemon, and I love cheesecake – so I’m so excited to share this recipe with you! It’s a creamy, smooth lemon cheesecake with a crunchy graham cracker base. Then each cheesecake square is topped with blueberry sauce. 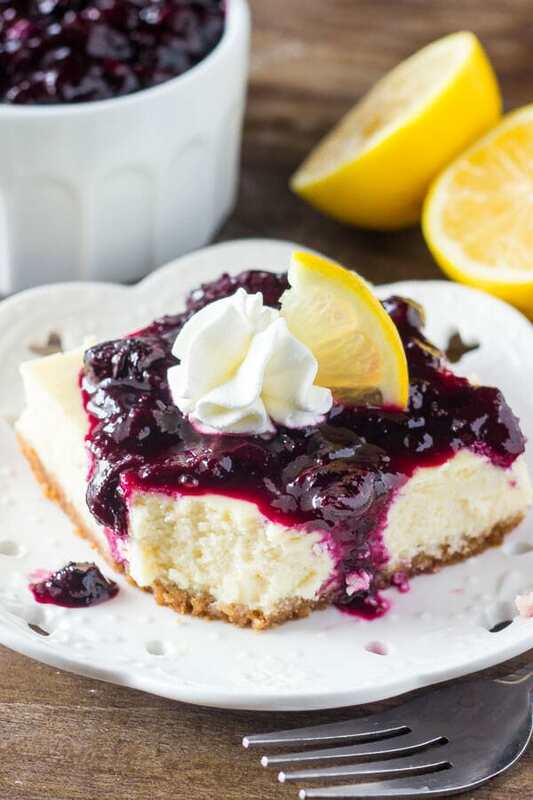 The tanginess of the lemon pairs perfectly with the creaminess of the cheesecake. Then the sweet blueberry topping really takes them over the edge. Can Cheesecake Be Made Without the Crust? Yes! Without a crust; this is a pretty, gluten-free, dessert. The nice thing about a crustless cheesecake is the time to make the recipe shrinks as well! No crust to make and bake! Now I don’t know about you, but I think lemon is one of the best fruits to bake with: the sunshine-y color, the slightly tangy flavor, and the way lemon can brighten even the dreariest of days. Plus, since lemons are available year round – you don’t need to worry about them being in season. They are chock-full of vitamins and antioxidants, making them some of the healthiest fruits on the planet. Lemons are a good source of thiamin, riboflavin, pantothenic acid, iron, and magnesium, and are an excellent source of fiber, vitamin B6, calcium, potassium, and copper, as well as folate and potassium. For the lemon flavor in today’s lemon blueberry cheesecake squares, we’re going to use both lemon zest and fresh lemon juice. You’ll want to use freshly squeezed lemon juice instead of lemon juice from the bottle – I find the bottled lemon juice can be too tart for baking and doesn’t produce the best results. Then the fresh blueberry sauce is made by heating up blueberries, water and a little sugar in your saucepan. 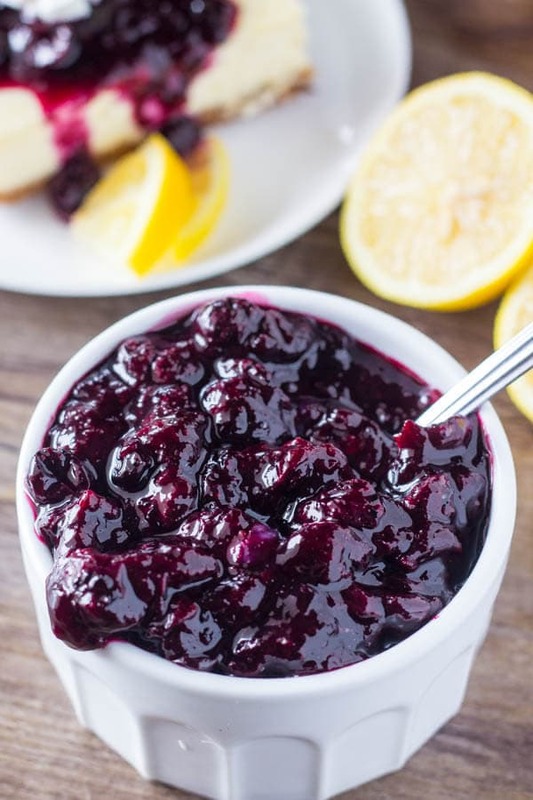 You can make the blueberry sauce in advance, or right before you’re about to serve your cheesecake. It’s also super delicious on waffles & pancakes too. Blueberries are a good source of vitamin K.
They also contain vitamin C, fibre, manganese and other antioxidants (notably anthocyanins). To make our cheesecake bars, it isn’t too difficult. However, there’s a few key tips to make sure they’re creamy & smooth. Make sure all your ingredients are at room temperature before getting started. Your cream cheese should be soft. 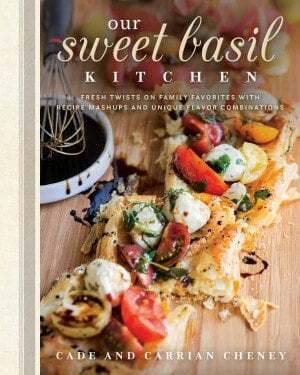 Use full-fat, brick style cream cheese for the most luxurious flavor. It’s important to beat your cream cheese very well until it’s super smooth. The last thing you want is big lumps in your cheesecake. Adding a little flour acts as insurance against cracks. When your cheesecake is done baking, it should still have a little wobble in the center if you gently nudge your pan. Cool the cheesecake slowly to prevent cracks. After it’s done baking, let it cool for about an hour in the oven with your oven turned off and the door open. Then take it out of the oven and allow it to cool to room temperature. If your cheesecake ends up with a few cracks – don’t worry! You can cover them up with the blueberry sauce. Always chill your cheesecake before enjoying. Cover the pan in clingfilm, then chill in the fridge for at least 4 hours or preferably overnight. The flavor is better after a cheesecake has chilled in the fridge. 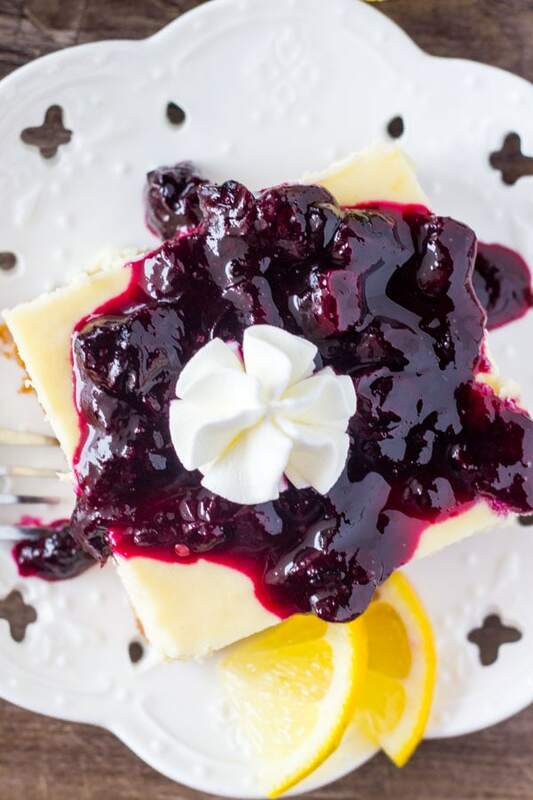 I absolutely love combination of creamy cheesecake, tangy lemon, and sweet blueberries – and I hope you enjoy these Lemon Blueberry Cheesecake Squares as much as we did! Before getting started make sure your cream cheese, eggs and sour cream are at room temperature. Cream cheese can be softened more quickly by cutting into pieces and microwaving in short 15 second bursts. Preheat the oven to 350F degrees and adjust your oven rack to the center of your oven. Line a 9×13 inch glass pan with aluminium foil and lightly grease with non-stick cooking spray. To make the graham cracker crust mix together the graham cracker crumbs and sugar in a medium bowl. Pour the mixture into the bottom of your prepared pan and press the crumbs down using the bottom of a measuring cup or your palms until it covers the bottom of the pan and is packed tightly. Bake in your preheated oven for 8 minutes. 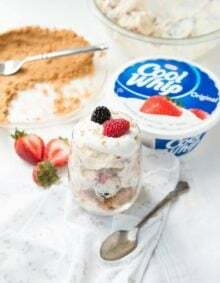 Then to make your cheesecake filling, first beat the cream cheese until well softened in a large bowl using a stand or hand-held electric mixer on medium speed. It should look smooth. Then beat in the sugar, lemon zest and vanilla extract until evenly combined. Turn off your mixer and scrape down the sides of your bowl using rubber spatula, then carefully stir in the lemon juice and sour cream. Then turn the mixer back on to low speed and beat in the eggs one at a time, followed by the flour. Be careful not to mix the batter too much after adding in the eggs. 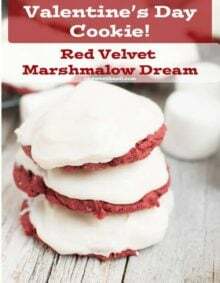 Pour the batter into your prepared pan on top of the graham cracker crust, then smooth the top with your rubber spatula. Bake in the prepared oven for 40-50 minutes, or until most of the top looks set except for in the very middle and when you give the pan a nudge there’s a slight wobble in the middle. Then turn off the oven, open the oven door about 6 inches and allow the cheesecake to cool in the oven for about 1 hour. Then remove from the oven and continue cooling til it reaches room temperature. Cover with clingfilm, and chill in the refrigerator for at least 4 hours or preferable overnight. In a medium saucepan over low-medium heat – add the blueberries, water and sugar. Allow the mixture to gently boil while stirring gently for about 10-15 minutes. It’s done when the blueberries soften and the mixture thickens. If your mixture seems too thick, you can add a little extra water. Remove the cheesecake from the fridge and allow to warm up for about 30 minutes. **Make sure to use freshly squeezed lemon juice. 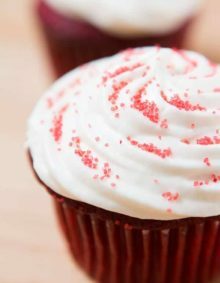 Do not use lemon juice from the bottle, as it is too tart for baking with. 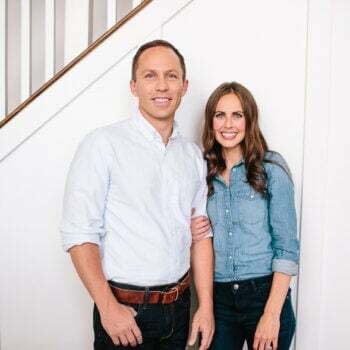 Head on over to my blog or connect with me on social media for more tasty treats! 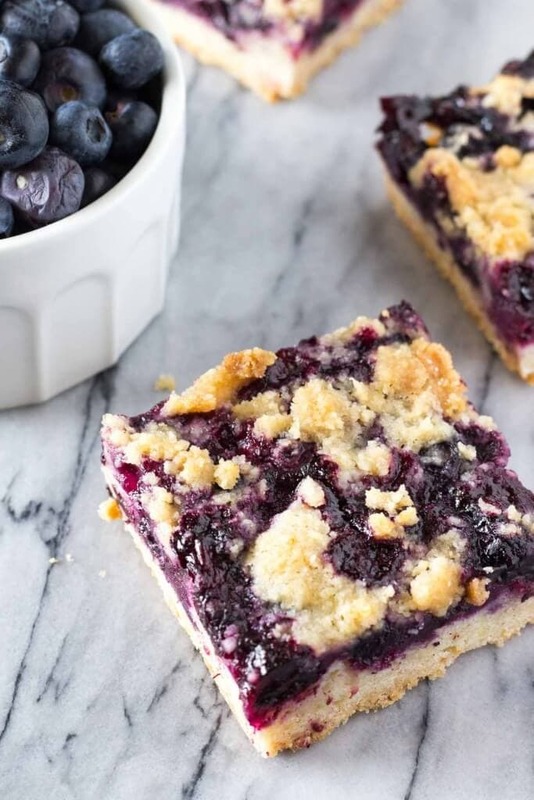 If you love blueberries, try these blueberry crumble bars. They have a have a buttery shortbread base and are bursting with fresh blueberries. 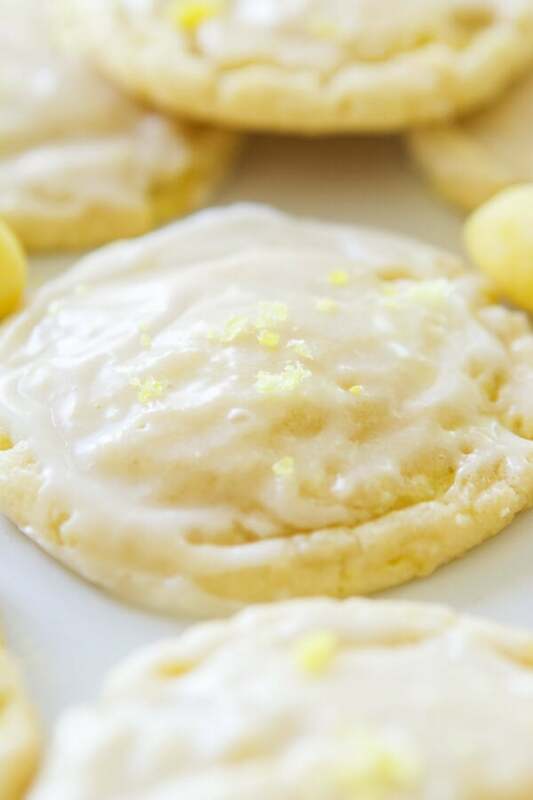 If you love lemon, these Lemon Drop Cookies are a definite must-try recipe! They have a delicious lemon flavor & a sweet glaze topping. Can an egg replacement be used instead of real eggs in the lemon blueberry cheesecake bars? I’m so sorry but eggs are essential to this turning out correctly. Great question though!